The El Torito Bootable CD Specification allows multiple boot entries to exist in Booting Catalog. 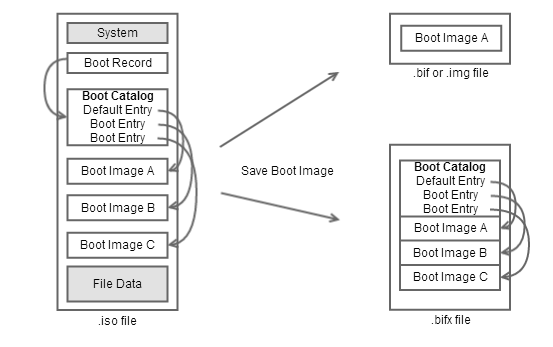 Boot Image File is usually suffixed with .bif or .img, which only contains single boot image of the default boot entry. For saving multiple boot images, a new file format (.bifx) was introduced in WinISO v6.4 . The .bifx file format is very simple. It simply concatenates Boot Catalog sectors and Boot Images sectors together. Each Load RBA (Bytes 8-12) of Boot Entries is the relative block address from beginning of the file.